Content expert Michael Tutton speaks with the creative and technical people behind interesting digital signage projects. 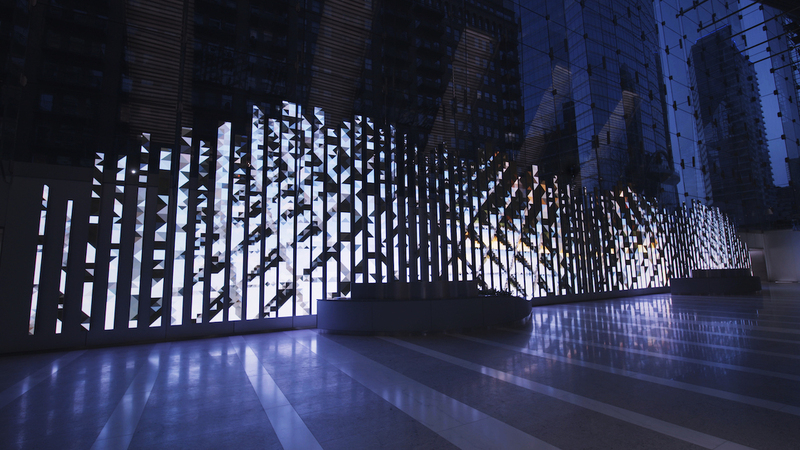 It is comprised of 89 individual vertical LED displays or 'blades' creating a canvas of over 3,000 square feet. The content is driven by an ‘intelligent content library’ that constantly changes over time. Essentially it’s living content, using generative algorithms to mix content using data and programming to keep it relevant. There’s no advertising, messaging or monetization. The owners wanted something that would never get stale and they go so far as to seek and commission artists to create content. The custom built system allows playback of a huge variety of content, including gaming engines. I spoke with Chad Hutson, President of Leviathan, a digital design creative agency about this 'living sculpture'.